The infernal bomb ticks away as panic sets in. 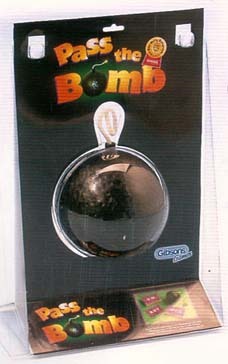 Player's nerves are tested to the limit as they grapple to find a suitable word and pass the bomb before it goes off! As the bomb has a variable length fuse, nobody knows when it will explode. When the turn reaches you, your task is to find a word that the letters on the card fit into. A word can only be used once in a round, but that's the only restriction. Sounds simple doesn't it, but it's reduced grown men to tears!